Get Zope and MySQL talking nice to each other. As a recent convert to Zope from PHP, I was curious: could Zope really give me all the capabilities I was used to in PHP? I decided to find out, by using one of my most common activities with PHP as the benchmark: connecting to and retrieving records from a MySQL database. As it turned out, Zope manages this quite well, and it's also nowhere near as complicated as you might think. And so, over the course of this article, I'm going to show you how to hook your Zope server up to a MySQL database, and write DTML code that allows you to retrieve and manipulate MySQL table records using standard SQL commands. If this sounds interesting, keep reading. First up, that all-important question: why? Why on earth would you want to connect your Zope system to an external database, especially since Zope already comes with its own, very cool ZODB? First, if your data is already in an existing RDBMS, you're usually going to find it tedious and time-consuming to migrate it all to to Zope's own database. It's far easier (not to mention less disruptive to your users) to leave your data where it is, and simply get Zope to talk to your existing RDBMS so that you can access the data within it in a simple, transparent manner. Second, Zope's own database is not really meant to perform the same tasks as a full-fledged RDBMS. The ZODB is a very powerful object database which keeps track of all the different objects you use in Zope, and it comes with some very neat transaction and versioning features. However, it's optimized to read data, not write it, and so INSERT and UPDATE queries tend to be sub-optimal on this database. It should be noted at this stage that, in addition to the ZODB, Zope does come with a small, SQL-compliant RDBMS named Gadfly, which can be used if your requirements aren't too complex. If, however, you're dealing with large record sets or complex queries, you will probably find Gadfly too slow and inefficient for your needs, and you will need to explore the possibility of connecting Zope to a more professional and full-featured RDBMS. Normally, setting up a connection between Zope and an external RDBMS like MySQL, Oracle, PostgreSQL or even Gadfly requires two things: a Database Connection object, which is used to perform communication between Zope and the specified database, and one or more Z SQL methods, which are used to execute queries on the database. Zope comes with adapters for a variety of different databases, including ODBC, Oracle, MySQL and Interbase. I'll be connecting Zope to a MySQL database in this article; however, the process is similar for other database systems. Hooking Zope up to MySQL is a little tedious, especially if you attempt to do it solely on the basis of the information available online. This is because much of the online documentation relating to Zope-MySQL connectivity is outdated and no longer relevant, and you can lose a whole day just trying out different variants of the techniques suggested. So let me make it as simple as possible. Install (copy) the ZMySQLDA files into Zope's Products directory (usually <Zope>/lib/python/Products). Extract the MySQLdb files to the same place. Configure and compile the driver (instructions are available in the source archive) using the Python binary that shipped with your version of Zope. This is extremely important, because if you don't use the exact binary that ships with your Zope installation, Zope won't know how to handle the driver. Install the compiled driver into your Zope build (again, instructions to accomplish this are available in the driver's documentation). This process works on Linux; however, despite my best efforts, I was unable to get Zope and MySQL talking on Windows. It's certainly possible, though, and the process is about the same - take a look at http://zope.org/Members/philh/ZMySQLDA_html for some hints. 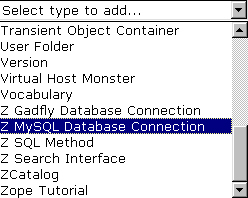 Assuming all goes well, you should now see a new Z MySQL Database Connection object type in the Type drop-down list within the Zope management interface. If you don't see this item, it usually means that something bad happened during the installation process. Drop by http://www.zope.org/Members/alanpog/zmysqlda_steps and see what you did wrong. With Zope and MySQL now talking to each other, it's time to start actually doing something with them. Here's the MySQL table I'll be using throughout this article - it stores information on my DVD collection. and see what happens. If your screen fills up with data, it means that your database connection is working just fine. Once a Database Connection object has been created, it's possible to instantiate Z SQL Methods to execute queries via this connection (I'll be doing this over the next few pages). In Zope, each of these functions can be implemented via Z SQL Methods. Each Z SQL Method stores one or more SQL queries, and these queries can be executed simply by calling the method in your DTML scripts. 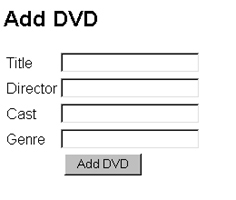 Let's see how this works by creating a Z SQL Method to list all the DVDs in my collection. Go back to the Zope management interface and create a new Z SQL Method from the drop-down list. I named my method "selectAllMethod"; feel free to name yours whatever you like. 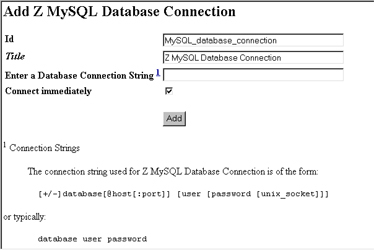 Remember to associate the Z SQL Method with an appropriate Database Connection object from the drop-down list; most often, this will be the Z MySQL Database Connection you just created on the previous page. This query template represents the query (or set of queries) to be executed when the "selectAllMethod" object is called. As you will see over the next few pages, it is possible to dynamically construct this query template on the basis of environment or form variables. Once the query template has been saved, you can test it via its Test function. When you do this, Zope will execute the newly-minted method and return the results to you for verification. This is an easy way to verify that your Z SQL Method works the way it is supposed to, and I would recommend that you do it every time you create a new one. As you can see, this is extremely simple. All I'm doing is invoking the "selectAllMethod" Z SQL Method created above and then using a DTML loop (via <dtml-in>) to iterate through the result set. This is identical to the procedure you would use in Perl or PHP to retrieve the results of a database query. Don't worry too much about the "edit", "add" and "delete" links in the list above - all will be explained shortly. For the moment, just study the manner in which the DTML Method invokes the Z SQL Method and iterates through the returned data set. Notice also that the fields of the returned record set are automatically converted to DTML variables, and can be accessed in the normal way, via the <dtml-var> construct. Next, how about adding a new record to the table? Here too, the process is similar - first create a Z SQL Method containing an INSERT query, and then invoke the Method from a DTML script. There's one important difference here, though - since the data to be entered is not hard-wired, but rather user-defined, the query string must be constructed dynamically. I'm sure the linkage between the arguments and the query template is now clear - the arguments passed to the Z SQL Method can be accessed in the query template to dynamically create a new INSERT query every time the method is invoked. In case you're wondering, the <dtml-sqlvar> construct is very similar to the <dtml-var> construct, except that it comes with a couple of additional, SQL-specific features - for example, the "type" attribute, which makes it possible to specify the data type of the values being inserted and thereby catch errors before the data gets inserted into the database, and the ability to automatically "quote" values before inserting them into the database. So that takes care of the SQL. Now, how about a form to invoke this method and pass arguments to it? Fairly simple, this - the <dtml-call> construct is used to invoke the selected Z SQL Method, and a neat little result screen is displayed. The form variables submitted to the form processor are automatically picked up by the Z SQL Method and used to construct the INSERT query string. If you're familiar with DTML, you'll know that the two objects above can be combined into a single one by creative use of an "if" conditional test keyed to the form's "submit" variable. And that's exactly what I've done next - a DTML Method named "add" which includes both the initial form and the form processor. Using this two-in-one technique can reduce the number of objects in your collection, and perhaps make things easier on the eyes. So that takes care of adding records. Now, how about deleting them? 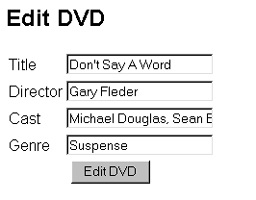 You'll remember, from the "list" DTML Method created at the beginning of this exercise, that every item in the DVD list has links pointing to "edit" and "delete" objects, and that these objects are passed the record ID of the corresponding item. The "deleteMethod" Z SQL Method contains a simple DELETE query, with the record ID passed to it inserted dynamically into the query template. The final item on the agenda involves building an interface and methods to edit existing records in the database table. Again, I'll hark back to the "list" object created right at the beginning. You'll remember that this "list" object also contained a link to an "edit" object, which was passed a record ID (in much the same way as the "delete" object discussed on the previous page). The record ID, obviously, gets passed to this method as an argument from the "list" object. Notice, from the DTML code above, that the record ID is again passed forward to the form processor via a hidden field in the form. Once this form is submitted, the form processor takes over. As with the original "insertMethod", the UPDATE query above is dynamically constructed on the basis of form input variables. And you're done! You now have a Zope interface to add, edit and delete records from a MySQL database. Wasn't all that hard, was it? If you've been paying attention, the process of communicating with MySQL through Zope should be fairly clear. Assuming a working database connection, there are two basic things you need: Z SQL Methods to execute queries (these Z SQL Methods can be passed arguments so that queries can be constructed dynamically, as demonstrated in this article) and DTML Methods to invoke the Z SQL Methods (and pass them arguments, where required). If you're used to PHP or Perl, this hard separation between methods and their invocation may be somewhat difficult to grasp at first. However, if you persist, you'll soon find that Zope's object-based approach to SQL is actually preferable to the looser approach in those languages. By encapsulating specific SQL functionality into objects, Zope immediately allows reuse of those objects - and, by implication, their specific functionality - across a Web site; this, in turn, makes it possible to package complex queries into a single object and invoke it wherever required, as many times as required. One of the most obvious advantages of this approach becomes visible when you need to perform a series of related queries - for example, insert a record into table A, retrieve the ID of the inserted record, use that ID as a foreign key when inserting a record into Table B, and so on - multiple times. Zope makes it possible to create a generic Z SQL Method that accepts a series of arguments and performs - internally - as many queries as are needed to achieve the desired result. A user of this Z SQL Method can invoke it transparently, as many times as required, blissfully unaware of the activities that take place within it. Take it one step further: if changes are required, they can take place within the Z SQL Method, requiring no changes at all to the DTML Methods that invoke the object; this obviously makes maintenance easier. This article was first published on 01 Mar 2002.